iGoogle, previously known as Google's personalized homepage, offers two options to backup your gadgets and feeds at the bottom of the settings page. There's an option to backup the iGoogle page on Google's servers. While this may seem pointless, it's useful to backup your page before adding gadgets that might create problems. 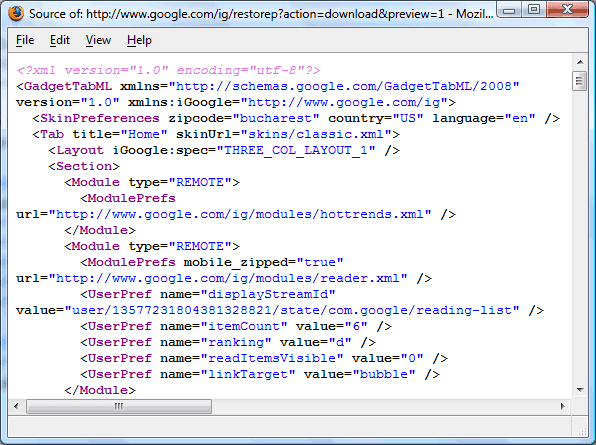 The second option is to download an XML file that includes all the tabs, layouts and themes, the feeds, gadgets and their settings. The XML file can be imported in any iGoogle page, so this is a good way to migrate the page to a different Google account. You can also download the XML file to change the settings in a text editor and then upload the new version. I'm a big fan of the iGoogle concept. I treat it as my personalized replacement for reading the front page of a daily newspaper. I want to try it again, my first experiences weren't very good. To those of you not particularly enamored with igoogle its worth repeating the availability of a module that enables entire web pages to be posted as featured in Google Operating Systems, February 18, one in which I've used to great effect. The problem I have with iGoogle is that one needs to be signed in. It gives me the sense they are watching over my every move -don't like that at all. You may be able to save the URLs (XML) of your iGoogle gadgets but you will not be able to use them on a start page. The iGoogle start page is to be closed down by Google - a stupid decision. Gadgets cannot be used on any other start page from other sources. The URL just takes you to the developer's webpage and it is usually a white blank page with nothing actually working. Sorry. It is the end!